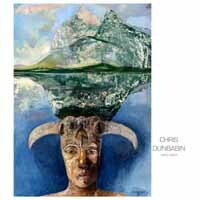 This website is devoted to the work of Chris Dunbabin who was was a prolific, talented painter. 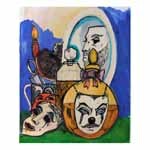 He sold or sometimes bartered most of his finished work during his lifetime. He was widely read and enjoyed being 'eccentric' but was also a private poet and accomplished sculptor. I publish a short run book with beautiful copies of his work. The book was started when Chris died in 2007. The 7th limited edition of the book contains more than 160 images of his work in glorious colour and will deliver in late January 2011. Random page selected from the 7th limited edition. Printed in hardback at 11.5x11.5". I am trying to locate paintings which I have not photographed. If you own one or more Dunbabin's, (and live in the UK) I will come and photograph the work. 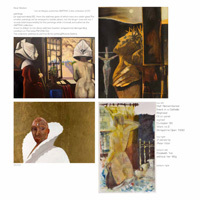 If you have an old Exhibition Catalogue and I have not got a copy- may I borrow it ? 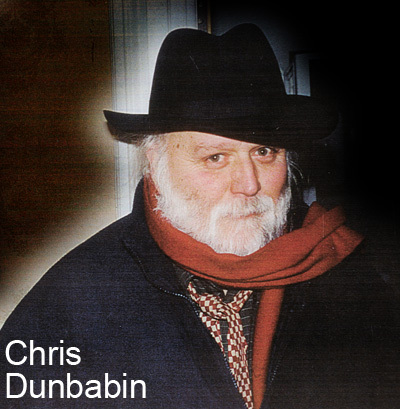 There are quite a few people who have pictures by Dunbabin, that I failed to visit in 2010 for one reason or another. I am still interested to shoot their pictures but I am no longer offering a free copy of the book. New pictures shot in 2011 will be included in the 8th edition and copies of the book will be available to owners at printed cost. - if you were promised a copy and have not received it please ask !